The Pre-Orders for WooCommerce Plugin allows you to add and configure pre-orders in your store, allowing your customers to order products or services before they’re available. You have the option to automatically release the orders at a certain date and time, or manually do so when you’re ready to ship. Download this plugin instantly at a 92% off discount! How can Pre-Orders Plugin for WooCommerce help your business? Pre-Orders Plugin for WooCommerce gives you the power to setup products in your WooCommerce store which you’d like to make available for pre-order. Let’s say you’re releasing a product two months from now: you can add that product to your store today, and allow customers to pre-order it, and automatically process their payments when the item is ready to be shipped. This is an excellent method for selling t-shirts or other printed materials which are best ordered in bulk. This plugin allows you to easily and efficiently notify your customers before-hand so they know when to expect their item, and most importantly, when they’ll be charged. Optionally charge an initial fee for pre-orders (akin to a “reservation fee” or “convenience charge” at some establishments). Pre-Order items are assigned a “pre-order” status, so you can filter them easily in the WordPress dashboard. The power to email all customers who have pre-ordered any given product. Change the release date for a pre-order product. Automatically process payments when a pre-order is available. Optionally assign a date/time when the product will be released. Cancel pre-orders if the item isn’t available any longer. 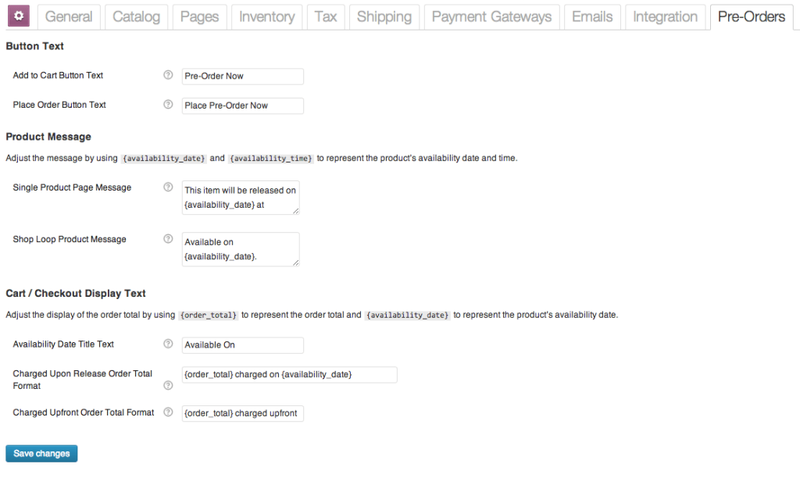 With WooCommerce Pre-Orders Plugin, you’re in complete control over how pre-order products are displayed. By default, the plugin pulls your styles/settings for button text, product messages and all other elements it utilizes. You’re able to display a countdown anywhere on your site that supports shortcodes, which you can then customize with CSS rules. You’re able to charge for pre-order products in one of two ways: upfront, or upon release (generally, prior to shipment). With upfront charging, your customer’s payment for the pre-order is processed during their initial checkout, regardless of the product’s release date. With the “upon release” payment option, your customer’s payment method is charged when the item is released, if you’re using a supported payment gateway, like the Authorize.NET CIM Payment Gateway. You’re able to release the item manually, or automatically at a predetermined date. All pre-orders are managed through a page in your WordPress dashboard, where your shop manager can delay, complete, cancel or email selected pre-orders, or use the action settings to automate the same actions for all pre-orders of a specific product. When you use a supported payment gateway, you’re able to save your customer’s payment method during the initial checkout, and automatically charge them when the item is released or available to be shipped. As of now, Authorize.NET CIM and Braintree TR support automatic payments for pre-orders. All other payment gateways support manual payments. Manual payments work by notifying your customers via email, asking them to return to your site and pay for the pre-order when it’s released. Download Pre-Orders Plugin for WooCommerce today at a 93% discount! Pre-Orders Plugin for WooCommerce is licensed under the GPL, which allows you to use it on as many websites as you'd like without having to repurchase.